The biggest players in the US banking industry have been on the hot seat ever since the housing collapse of 2008 exposed a number of misleading, predatory and downright illegal practices perpetrated both at home and abroad. Now, as another round of penalties come down on five of the country’s leading financial institutions, one senator is questioning whether these banks can be trusted to handle their clients’ hard-saved retirement money. The housing collapse of 2008 came about as a direct result of bad banking practices, which contributed to the housing bubble that later burst so spectacularly and left millions of homeowners in default or foreclosure. In the years leading up to the crash, banks large and small had been making loans with wild abandon, often to extremely unprepared borrowers. Using a variety of hard sell and misleading tactics, mortgage lenders enticed buyers with no-down, no- interest or interest only loans that stated out with low monthly payments hat swiftly ballooned into larger ones that these homeowners couldn’t repay. Many claimed that they didn’t even understand the terms, and others said they were misled by bank officials. As lawmakers and financial experts picked up the pieces after the crash, the nation’s biggest financial institutions – JP Morgan Chase, Citigroup, Bank of America, Barclays and several others in varying combinations – became the target of a string of criminal and civil investigations and lawsuits. A wide range of malfeasance was unearthed in those actions, ranging from the famed “roboosigning” controversy in which foreclosure actions were slipped through with false signatures to accusations on the international front of manipulating the LIBOR exchange rates that drive world currency exchanges. Most of the suits pressed against the banks have resulted in a series of multimillion-dollar fines and a few criminal cases against individuals. And the ongoing scandals did lead to the enacting of the Dodd Frank Wall Street Reform and Consumer Protection Act in 2010, which imposed tighter standards on mortgaged lenders and, indirectly, on borrowers as well. But throughout all the investigations, charges, hearings, lawsuits and regulation, the banks involved have been allowed to continue conducting business largely as usual, with no interruption in the usual services they provide. That may change, though, if US Senator Elizabeth Warren (D-Mass) has her way. At issue are the most recent charges of manipulating international monetary exchange rates leveled against JP Morgan Chase, Citigroup, Bank of America, Barclay’s and the lesser-known UBS AG. As a recent article from Business Insider reports, four of the five have already pleaded guilty to criminal charges of illegally tweaking international exchange rates, while UBS AG is expected to do the same in the coming weeks. But although these banks have been fined a total of nearly $6 billion, they’ve been granted waivers from the Securities an Exchange Commission that allow them to conduct their usual securities based banking activities -with the notable exception of handling retirement pensions and plans. They need to apply separately to the US Department of Labor to request exemptions for managing those kinds of accounts. In the past few years, workers in a all kinds of industries and businesses have seen their pension plans mismanaged, whittled away, or outright eliminated, thanks to bad judgment and shady practices on the part of both employers and the banks and institutions tasked wit handling those plans. That’s why Senator Warren is calling on the Department of Labor to conduct public hearings before granting these banks any kind of waivers to conduct business involving pension plans and retirement funds. It’s a move in support of the individual consumer, the worker hoping to have funds to live on after retirement. Given the past track record of these banks where responsible handling of client interest is concerned, and the SEC’s record of granting easy waivers, the call for Labor hearings is also a call for greeter accountability. The provisions of the Dodd Frank Act and its creation, the Consumer Finance Protection Bureau, are largely aimed at protecting mortgage applicants from the kinds of bad baking that created the collapse – not pension holders. 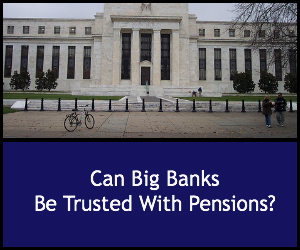 Hearings would shed light on these banks’ practices in the pension plan arena – and might create better protections and more accountability there too.